This week, Wallace sat down with Pacquiao to discuss everything from the possibility of fighting Floyd Mayweather to the importance of faith in his life. Okay… Clearly, his English is not the best, but given that its not his first language, the Fillipino Congressman and boxer gets a pass. 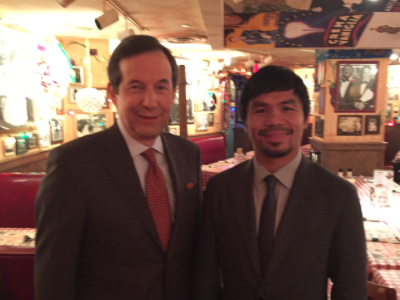 Pacquiao, who attended the National Prayer Breakfast on Wednesday, also discussed his humble beginnings and the role of faith for him. Last week, Washington Redskins Hall of Famer and Super Bowl MVP, Johns Riggins, sat down with Wallace to talk about his Super Bowl memories before the big game.